International Nowruz Day was proclaimed by the United Nations General Assembly, in its resolution 2010, at the initiative of several countries that share this holiday (Afghanistan, Albania, Azerbaijan, the Former Yugoslav Republic of Macedonia, India, Iran (Islamic Republic of), Kazakhstan, Kyrgyzstan, Tajikistan, Turkey and Turkmenistan. ஆண்டுதோறும் ஐக்கிய நாடுகள் அவையால் "சர்வேதேச நவ்ரூஸ் தினம்" மார்ச் 21, அன்று கடைபிடிக்கப்படுகிறது. நவ்ரூஸ் தினம் என்பது உலகமெங்கும் வாழும் பாரசீக மக்களால் கொண்டாடப்படும் புத்தாண்டு தினம் ஆகும். 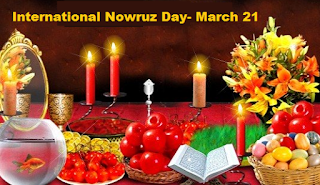 Nowruz is Persian New Year, Nowruz marks the first day of spring and is celebrated on the day of the astronomical vernal equinox, which usually occurs on 21 March. It is celebrated as the beginning of the new year by more than 300 million people all around the world and has been celebrated for over 3000 years in the Balkans, the Black Sea Basin, the Caucasus, Central Asia, the Middle East and other regions.